Glyphs in all their Glory. What do they do and how does it work? It has come to my attention that the new update gives a lot of headache. So here comes a quick list of questions one may have. If you still happen to have a question, then don't hesitate to reply below. How does the new update affect the current heroes? The new update has brought in a new way to empower your heroes. This way is called Ruminating and litterally means Deep thinking. It allows your heroes to gain additional features at the cost of basic resources of your choice. This can be applied on all epic heroes with a few restrictions. One must use glyphs on heroes to attain additional features on his or her heroes. To do this, you must first acquire a building called the Sanctum. Once built, tap on the building and open the tab Glean. 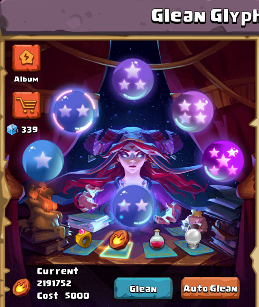 You will then be presented with a lady who looks much like the old Ambrosia where she's holding 5 glass spheres. These spheres represent the quality of the glyph you are likely going to get. Select the resource you'd like to spend on the roll. Before you roll, the cost will be displayed at the bottom. The higher the quality of the glass sphere the lady is currently holding, the better your glyph outcome will be. About 50% or so of the rolls will contain exp glyphs, including the almighty hard to get ancient glyphs. Sanctum level does not appear to alter the odds of getting a better glyph. Keep rolling until you see a statisfying glyph to your wishing. This is where the restrictions come in. Alternatively, one could go to the glyph store to get an ancient stone of choice with Glyph Fragments. This is much like fervor on hero talent rolls: it slowly .... very slowly builds up until you can get a good stone with the currency presented in the top left of the screenshot below the shopping cart. How does one use glyphs on their hero? Tap on the building, tap Ruminate and you will be presented with a menu where you can select your epic heroes, ready for their upgrade. Place your desired glyph in the first slot. Then work your way down the tree. At first only the first slot will be available for use. If you want to unlock more slots, you will have to level up the sanctum building to the respective levels. Not only that: it takes real life days to unlock the next slot once your sanctum reached the desired level. One can speed up this process using hour glasses, currently obtained in Battle Square or when jewels are bought with the right events active at the time of buying. - Glyphs can only be attained at the Glean place. - Glyphs do not immediately have their highest potential. You must level them like you would level your heroes, except that it's done with other glyphs instead of eggs and heroes. - Glyphs have a shape which must fit in the slot where you want to use it. 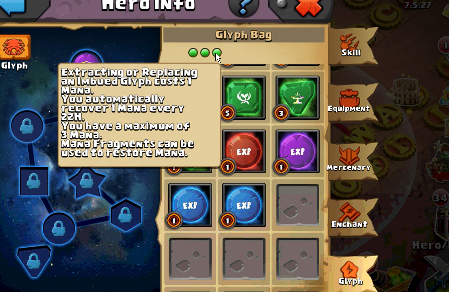 - Multiple glyphs can be given on a hero at once as long as the shape of the glyph matches the shape of the slot. If you aren't statisfied about the currently imbued glyph, then one could extract his glyph of choice to replace it with another glyph. This action costs 1 mana. 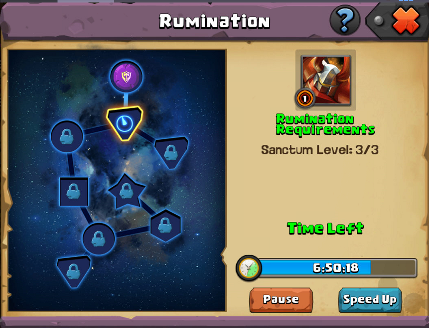 To get to this option: Tap the Sanctum, go to Ruminate, tap the glyph you want to replace and tap Imbue. Then tap the glyph again and tap Extract. Now tap the glyph you want to imbue and select the proper slot. Well all my muta rings and souls are currently being dumped into evolving heroes like wolf, enlightment, insight etc...need rings to get skill 25 and 30 in caee of some heroes...is it worth putting those things on hold to try and work on these glyphs...!? does anyone works about mutagen cost for upgrade this building ? i looking for it at wiki but can't find anything about this building.